Members of the large and diverse succulent family have in common the classification as flowering perennials that store water in their fleshy leaves, stems or roots. Because of this trait, they can survive periods of drought. All cacti are technically succulents, but the majority of succulents do not share cacti's needlelike spines or preference for desert growing conditions. Ideal container plants, succulents need to grow in a specialized soil mix with better drainage than typical potting soil provides. 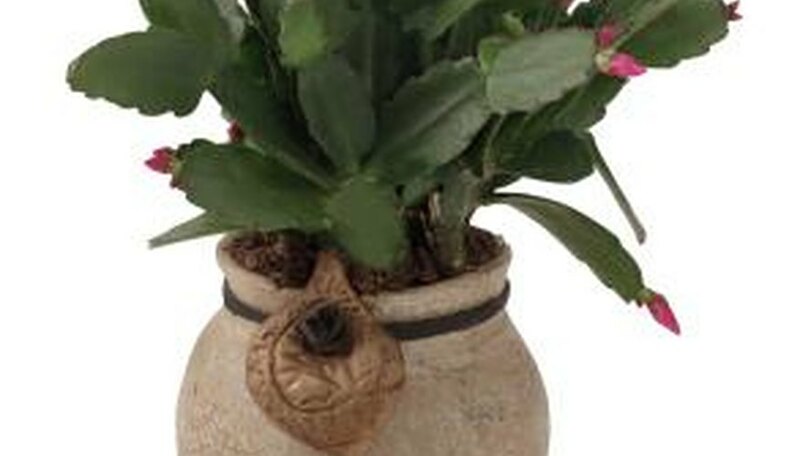 Although commercial cactus potting mix can be purchased, it tends to be expensive. Many who grow succulents like to prepare their own. Each gardener's formula differs from others' recipes, but all contain regular potting soil or compost plus texturizing material. One of the simplest formulas is a mixture of one-half bagged potting soil and one-half pumice, a crushed volcanic rock. A slightly more complex recipe calls for 5 parts perlite or pumice, 4 parts potting soil, 1 part coarse sand and a pinch of rock dust. For a bit richer mix, try one-third compost, one-third horticultural-grade sand and one-third pumice. Because all succulents like soil on the acidic side, maintain this by mixing 1 tablespoon white vinegar into each 5 gallons of water used to irrigate the plants. As plump succulents can stay too wet if the ratio of potting soil is overly high and delicate-leaved varieties may dry out if too much pumice is included, adjust the ratio according to the type of succulent being potted. For the fleshiest varieties, 70 percent pumice to 30 percent potting soil works well. In the case of succulents with fine leaves, reverse the ratio, using 70 percent potting soil and 30 percent pumice. If the pot will contain a combination of succulent types, use a half-and-half soil mix. In addition, mound soil in the planter and place thirstier plants around the bottom and those needing less moisture at the top. Carefully select the ingredients for your soil formula. Many succulent growers bypass peat-based compost, believing that it can introduce pest problems, like the root mealy bug and fungus gnat. Instead of using compost at all, a high-quality bagged potting mix is acceptable, especially if you sift it through a screen to remove small impurities, such as pieces of wood and twigs. Ensure that the sand component is horticultural-grade. Lower-grade sand may contain undesirable elements like salt. After removing the plant from its former pot, tease apart the roots. If any appear dead or are coiled up, clip them off. Check for weeds and pests. Place the plant in the larger pot, and cover it up to the crown with dry, fresh soil mix. You can top-dress the soil with gravel, small river rocks or aquarium stone, but it is not necessary. Wait for a week or two before watering, allowing the succulent to rest away from direct sunlight. Any roots damaged in repotting will have the opportunity to heal during this time. If unhealed roots get wet, they become very susceptible to both bacterial and fungal infections.